Please join me Sunday, September 3rd at 11 am for a cooking demo at the Olney Farmers' Market. I'll be joined by my friends Mary and Jim, the garlic mavens, and we'll be completely focused on the original superfood. It's a great market - lots of wonderful food vendors, artists and music. The market is open every Sunday between 9 and 1 for a fun community experience. See you there! Debbie has been doing our Wellness healthy cooking class for the last three years. Her recipes are easy, delicious, low cost and most important healthy. We look forward to learning something new every year. I have been extremely fortunate to experience a number of cooking classes with Debbie (so many I have lost count, at least 6, possibly more). If you have an opportunity to experience a cooking class with Debbie, don’t miss it. She offers helpful information about what spices and foods contribute to your health and wellbeing; what foods to buy organic and which you can skip; tips on how to cut, peel, and prepare ingredients; what more healthy ingredients to substitute for less healthy ones; and delicious food in a fun and relaxed atmosphere. You even leave with recipes that you can (and will want to) recreate at home. My family and I are very grateful for all that she has taught me. Thanks, Debbie! I have had the pleasure and privilege to attend all of the classes that Debbie has taught for Loudoun County Public Schools. They are fun, informative and the food is fantastic. She always introduces each class to foods that are different and shows us how to prepare them. Debbie always has samples of the spices she uses. She has so much knowledge and always share it with a smile. I have prepared many of the recipes she introduced to us. They are easy and my family does not know they are nutritious because they taste so good. I look forward to more classes. Debbie, you are the best. I first met Debbie Amster when a friend told me about this amazing women who teaches others about the benefits and power of whole foods. I signed up for a spring cleanse that included weekly sessions on nutrition. She had me share with her what I wanted out of the sessions & she far surpassed that. She has such a passion for sharing her knowledge of living a healthy lifestyle. From delicious recipes, to sharing many websites, to taking advantage of local farms & markets -she is a wealth of information and helpful advice. Her sessions also included dinner from recipes she shared with us and sometimes we took part in the actual cooking. She always kept things interesting as well as informative. She also let you know that you could call or email her anytime with questions. 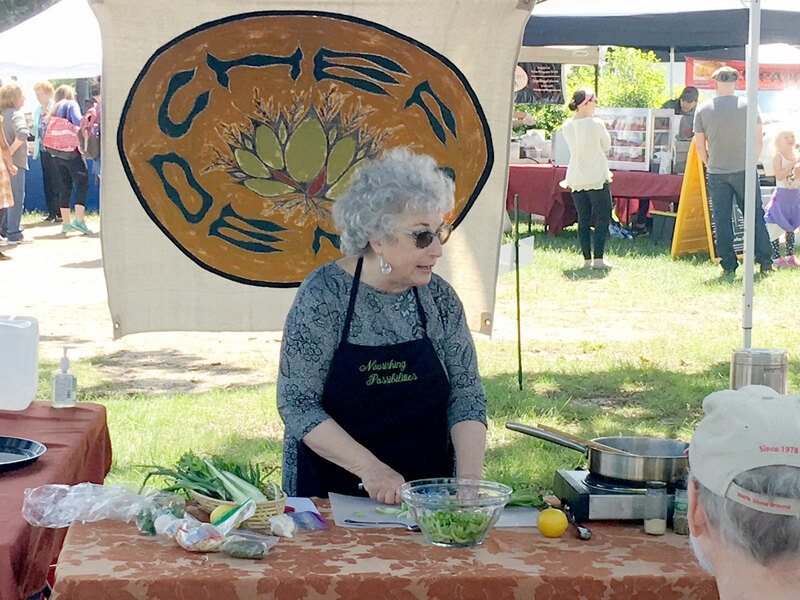 I attended a cooking demonstration at the local farmers market and one in her home. Again so interesting as well as informative & enjoyable. Debbie has been one of our most popular demo chefs for several years now. When she presents her delicious dishes, everyone is sure to be entertained, educated and enlightened. She shows us how surprisingly easy and tasty healthy cooking can be!